Genetic modification therapies are changing the landscape of medicine. These advanced therapies have the unprecedented ability to offer a one-time cure for severe, debilitating diseases that were previously untreatable. BCC Research found that this industry is segmented by technology platform, delivery method (viral versus nonviral), and clinical application. This specialization enables companies to build significant barriers to entry and competitive advantage. Strong patent and licensing arrangements also contribute to these competitive positions. Manufacturing to meet the large-scale demands of the industry will play an important role in the future. The interest level in corporate partnerships has been enhanced by recent clinical successes and regulatory approvals for genetic modification therapy candidates. Industry alliances have been centered on several objectives, including access to genetic modification therapy technologies by large pharma/biotech, access to delivery technologies, and entry into new therapeutic markets. The global market for genetic modification therapies is estimated at $2.3 billion in 2018. It is forecast to expand at an impressive compound annual growth rate of 49.9% to reach $17.4 billion in 2023. 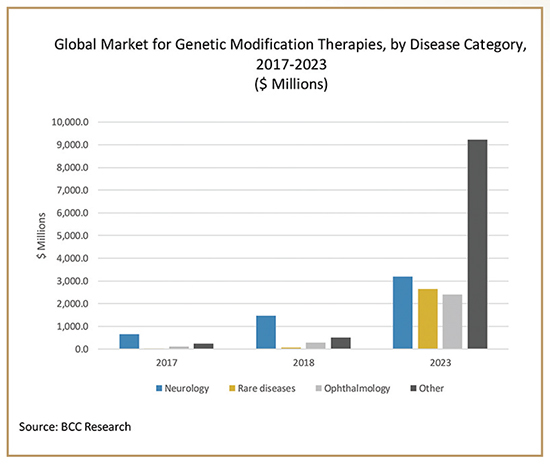 Growth in the market for genetic modification therapies is being driven by applications in oncology, neurology, rare diseases, and ophthalmology. In rare diseases, genetic modification therapies create new profit streams. In fields such as oncology, neurology, and ophthalmology, genetic modification therapies have the potential to disrupt current markets. Key factors for meeting revenue forecasts include continuing demonstration of genetic modification therapy efficacy and safety in clinical settings, migration to earlier-line settings in cancer, and success in efforts to standardize and scale up the manufacture of viral delivery vectors. The following sections examine the main genetic modification therapy platform technologies: gene therapies, genetically modified cell therapies, RNA therapies, and gene editing. A rich late-stage pipeline of gene therapies is being developed for a wide range of disease categories. In the next 5 years, gene therapy is poised to exert a significant influence on genetic modification therapies. Gene therapies seek to permanently replace defective genes in a cell’s DNA. This can restore cellular function and has the potential to totally eliminate a disease. Monogenic diseases, for which a specific disease-causing gene can be identified, are well-suited for gene therapies. Payload and delivery are the main components of a gene therapy. The payload contains the gene sequence that encodes for the production of a protein. Also included in the payload are DNA sequences that regulate transcription of the gene. The delivery component of a gene therapy includes the vector that is needed to deliver the payload into target cells. Gene controls can be used to yield more reproducible results. Promoters play an important role because they control the amount and location of therapeutic gene expression. Other control elements, such as insulators, can help with the stability of therapeutic gene expression; however, they also increase the probability of insertional mutagenesis. The delivery construct that is chosen can play a vital role in the therapeutic. The two main classes of delivery technologies include viral (eg, adenoviruses, adeno-associated viruses [AAVs], retroviruses, lentiviruses) and nonviral (eg, plasmid DNA, transposons, naked DNA/RNA complexes). The optimum delivery vehicle yields high expression of the payload within the target tissue without inducing an immune response in the host. Considerations for choice of delivery method include the cell and tissue type being targeted, systemic versus local delivery, use of tissue-specific versus constitutively active gene controls, and profile of the payload to be delivered. To be successful, gene therapy candidates must meet important clinical criteria: 1) the pathogenic mechanism should be clear and addressable, 2) the target organ must be accessible to the gene therapy, and 3) there must be a compelling, unmet medical need. Luxturna, which is the first gene therapy to be approved by the FDA, fully meets these criteria. Luxturna is indicated for biallelic RPE65-mediated inherited retinal disorders. In this indication, mutations in the RPE65 gene is the clear and addressable pathogenic mechanism. The target organ (the eye) is easily accessible to the gene therapy, which uses an AAV2 viral vector to carry the correct version of this gene. Finally, there is a clear and pressing medical need for therapies that can restore functional vision in children and adults who have this disorder. Genetically modified cell therapy incorporates a functional gene into a cell-based therapy. The genetic modification occurs outside the body, and the resulting genetic change to the patient’s DNA is permanent. The active payload consists of the gene encoding for production of the therapeutic protein and gene controls that regulate production of the therapeutic gene. The vector, which can be either non-viral or viral, delivers the gene and gene control payload to the cells that are to be genetically modified. The most common cell types include T cells, NK (natural killer) cells, and HSCs (human stem cells). The main types of genetically modified cell therapies include chimeric antigen receptor (CAR) T cell, T-cell receptor (TCR), Listeria-based, tumor-infiltrating lymphocyte (TIL), NK, and HSC. CAR T-cell therapy involves tumor binding and activation domains; CAR T cells recognize specific tumor antigens and kill tumor cells. TCRs have alfa and beta chains that recognize peptides on the surfaces of tumor cells; the T cells then kill the tumor cells. Listeria-based therapy targets dendritic cells, which present tumor antigens and activate tumor-killing T cells. In TIL therapy, a patient’s own TILs are isolated and expanded ex vivo. TILs are then infused back into the patient to attack and kill tumor cells. NK cells can be infused into a patient, where they attach to tumor cells and deposit cell-killing granules in the cytoplasm. HSC therapy entails adding a functional gene to HSCs outside the body and reinfusing them into the patient; the genetically modified HSCs carry the therapeutic gene. In CAR T-cell therapy, the key therapeutic manipulation made to cells is through a gene product that is delivered by a vector. For CAR T-cell, TCR, TIL, and NK therapies, challenges include toxicities, production, and immunosuppressive tumor microenvironment. CAR T-cell therapy has entered the clinic; BCC Research forecasts that CAR T-cell therapy will achieve significant sales revenue. RNA therapeutics alter the expression of a gene. The therapeutic consists of an oligonucleotide and a delivery vector. In some cases, the delivery component is the naked oligonucleotide. The oligonucleotide can be either DNA or RNA, which is complementary to the DNA or RNA sequence of the targeted gene. The delivery vector can be viral, nonviral (eg, antibodies, aptamers, nanoparticles), or naked. The main RNA therapy segments include RNA interference (RNAi; stops production of the disease-causing protein), antisense interference (inhibits or enhances translation of mRNA into protein), microRNA modulation (miRNA; also inhibits or enhances translation of mRNA into protein), and messenger RNA (mRNA; produces therapeutic protein). RNAi is in development for a range of indications, including cancers and infectious diseases. RNAi consists of a double-stranded (ds) DNA oligonucleotide, which is delivered to the patient either systemically or locally to specific tissues or organs. RNAi triggers the RISC (RNA-induced silencing complex) pathway, which results in the cleavage of mRNA corresponding to the therapeutic dsDNA sequence. This shuts down specific proteins that cause a disease or disease symptoms. Antisense technology uses a single-stranded RNA molecule that is complementary to an mRNA. The antisense molecule binds to the mRNA to either inhibit or enhance translation of the mRNA into a protein. miRNA therapy uses short, single-stranded RNA molecules that can regulate protein production. miRNA modulators can either shut down or enhance production of a particular protein. mRNA therapies use mRNA molecules that can produce functional proteins after being introduced into the patient. mRNA does not enter the nucleus but remains in the cytoplasm; thus there is no risk of insertional mutations. mRNA is not classified as a gene therapy because it does not modify the genetic material of living cells. Gene editing technology is still in its early stages of development, with drug candidates just beginning to enter the clinic. Gene editing therapeutic strategies include gene knockout (stops production of a protein), gene correction (replaces or repairs a dysfunctional protein), and gene insertion (starts production of a new protein). Gene editing relies on the use of engineered nucleases, which are artificial proteins composed of sequence-specific DNA binding domains fused to a nuclease that cleaves DNA nonspecifically. Each gene editing technology is designed to perform three functions: recognize a specific (target) DNA sequence, bind to that target sequence, and cut DNA at a specific site within the target sequence. Meganucleases are engineered forms of restriction enzymes that have DNA recognition sequences (usually 12-40 nucleotides), together with a nuclease activity domain. The ability to target with meganucleases is limited. In addition, their engineering is challenging because the DNA recognition and nuclease activities are combined into a single domain. Due to these challenges, meganucleases will probably remain restricted to gene editing for small-scale research applications. Zinc finger nucleases (ZFNs) include a DNA recognition domain (the zinc fingers) linked to a Fok1 nuclease. There are typically three to six separate zinc finger repeats, each one comprising 30 amino acids stabilized by a zinc ion, which bind to a specific DNA triplet. Importantly, the Fok1 cleavage domain needs to form a dimer in order to cut the DNA. This requirement for dimerization provides a distinct advantage for target specificity. Extensive biotechnical engineering is required to achieve this superb target specificity. However, once engineered, ZFN therapy has high clinical utility. Transcription activator-like effector nucleases (TALENs) use the same DNA cleavage domain as ZFNs (Fok1). However, the recognition domain is completely different. This domain is an engineered version of a conserved repeat domain that comes from naturally occurring TAL effectors encoded by phytopathogenic Xanthomonas bacteria. The DNA binding domain has a highly conserved 33-34 amino acid sequence with differing 12th and 13th amino acids, referred to as repeat variable di-residues (RVDs). Each repeat domain binds to a single nucleotide (versus a triplet in ZFNs), and the RVD determines specific nucleotide recognition. TALENs are easier to engineer compared with ZFNs because their binding mechanism is relatively simple, with basic variations in the RVD needed for determining the target sequence. Clustered regularly interspaced short palindromic repeats (CRISPR)–based gene editing consists of a guide RNA (gRNA) for DNA recognition and a nonspecific CRISPR-associated endonuclease (Cas9). A key advantage of CRISPR-Cas9 systems is their ease of engineering; the targeting domain can be completely changed by altering only the gRNA. This is accomplished through molecular cloning versus the need for protein engineering as with other systems (ZFN, meganuclease, and TALEN). A second advantage of CRISPR-Cas9 systems is the ability to multiplex (simultaneously target with a single enzyme and multiple guides). The gRNAs used in CRISPR-Cas9 systems do not bind to target DNA as tightly as other systems, resulting in a tendency to make off-target cuts. Due to these off-targeting safety concerns, CRISPR-Cas9 systems are moving into the clinic with a strategic approach. The initial clinical focus is on treating severe genetic diseases with significant mortality or morbidity and where the benefit-to-risk ratio is high. A second consideration is the delivery vehicle for CRISPR, which currently permits deliveries to the eye, liver, and some blood cells, making these organs a near-term focus of clinical development. Optimization to develop next-generation gene editing drugs is ongoing, with the focus on improved tissue targeting and greater specificity to minimize off-target edits, improving persistence/engraftment of cells, and treating polygenic disorders. Rapid growth in the genetic modification therapies industry is due to a number of factors. Continuing advances in key technologies are driving growth of the genetic modification therapy market. Enabling technologies foster market growth by improving the clinical efficacy, safety profile, organ-targeting specificity, and durability of a given genetic modification therapy candidate. Enabling technologies include such items as expertise in viral and non-viral delivery modalities, promoter design to drive gene expression, cell culture, oligonucleotide and gene design and optimization, viral manufacturing technology, antigen targeting, and gene editing optimization. The growing interest on the part of large pharma or biotech companies is driving clinical development of genetic modification therapy candidates. The rich late-stage pipeline for genetic modification therapy candidates is a driving force of growth. The Phase III pipeline includes more than 40 product candidates. This pipeline is evidence of the safety and efficacy of the genetic modification therapeutic approach. Genetic modification therapies address real and pressing clinical needs. Many of the indications do not have any effective treatments, leaving only palliative care options. Genetic modification therapies can provide a complete cure in some cases, demonstrating an unprecedented level of clinical success. Because of the potentially curative nature of these medicines, there is enormous potential in many applications, ranging from cancer to neurology to rare diseases. Genetic modification therapies represent the next wave of medicines, with enormous potential for treating and curing debilitating and serious diseases. As a result of its wide scope, genetic modification therapies will play an important role in the future global medical economy. This article is based on a market analysis report published by BCC Research titled “Genetic Modification Therapies Clinical Applications: Gene Therapies, Genetically Modified Cell Therapies, RNA Therapies and Gene Editing” (BIO159A) by John Bergin. Laurie L. Sullivan, ELS, is a Boston-based writer and editor with 20 years of experience in medical communications. She is certified by the Board of Editors in the Life Sciences. She contributes regularly to the BCC Research content on Life Sciences. John Bergin is the author of previous BCC Research biotechnology reports and has held business development, sales, and marketing positions with a Fortune 500 advanced materials company, as well as executive management positions with a nanotechnology and separations company. Mr. Bergin earned his BS in Chemistry, his MS in Biotechnology, and a Masters of Business Administration.